The musical madness and mayhem continue in this sumptuous "sequel" to The Rocky Horror Picture Show - on DVD for the first time ever! Almost all of the previous home video releases of Shock Treatment were sourced from a misframed fullscreen transfer made about 1983. This DVD is presented in its original 1.85:1 theatrical aspect ratio (with slight black bars inside the widescreen frame), and every shot looks well-framed. Gone are the credits that were cut off the screen in the VHS version. The movie was shot open matte and projected at 1.85:1 in theaters (more info on widescreen framing is available here). This was taken from a High Definition transfer made for the release of this DVD, and it shows. The picture looks clear throughout, and is well-detailed, with great color saturation. This film is not as sharp-looking as newer films, but of course this is the result of it being a relatively low-budget film from 1981. Skin tones look accurate, except, of course, in the scenes that utilize bright reds, pinks, or greens exclusively, and those scenes have none of the color bleeding that was present on all past releases. Since this movie is all about television, there are scenes in the film that were shot by aiming a film camera at a TV monitor, and they look appropriately so. There are edge halos in a few scenes, but they're few and far between, and almost no macroblocking is to be found. The result is a very film-like image. Details like the text on Cosmo McKinley's badge, details in the DTV employees' folders, and various product placement, are now visible (look for the game of Boggle on top of the microfiche machine). 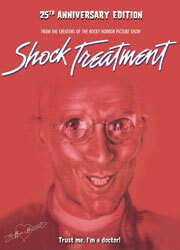 This is Shock Treatment on home video as you've never seen it before. 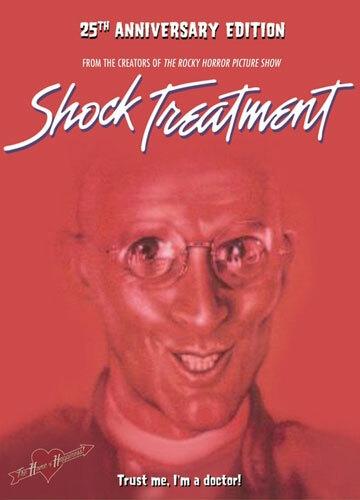 The original sound mix for Shock Treatment was 2-channel Dolby Stereo. A good deal of the original mix sounded monaural, with only the songs in the film being what benefitted from the stereo sound mix. In VHS releases, the movie suffered even more, with muffled sound, as well as strange "sound warps" occuring during during a few of the songs, sounding as if an audiotape was slowed down to half-speed for a split-second, then back to normal. In addition, the UK DVD featured something called a "pseudo-stereo" mix, something I've never heard of before. This version of the movie includes a new 5.1-channel mix. The film still sounds mostly monaural, except for a few sound effects and during the music. When the songs are on is when the mix comes to life. The music sounds like a "pseudo-5.1" mix for lack of a better word, with most of the music coming fron the center channel. This is not a full-fledged remix, but the music quality is faithful to the original source material. The warped noises are gone. All of the dialogue and vocals come from the center channel (with bleed to the front left and right during the songs), and are clear and intelligible. The 2-channel sound mix seems to be a downmix from the 5.1. For the most part, even the audio on the 2-channel track sounds clearer than ever before. A Spanish mono track is also included (with the songs recorded in English). Note: For those of you wondering if the "Overture" during the end credits has suffered the same fate of strangely coming in during the middle of the song, like the UK version of this DVD, unfortunately it has, on all audio tracks. The new audio edits during the end credits are strange and unnecessary (they simply could have cut out the Richard O'Brien version of the song "Shock Treatment" and left the Overture intact), but during the rest of the film, both the new 5.1 and 2.0 mixes get the job done. 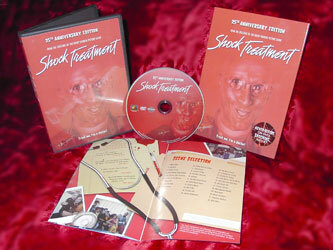 First we have a feature-length audio commentary by Shock Treatment Fan Club presidents "Mad Man" Mike and Bill Brennan. The two have interesting tidbits and details about the movie's obvious connections to Rocky Horror, trivia about the stars of the film, and more. The pair don't slow down for the entire film, and have a lot of fun and a lot to say. "DTV Presents: A Shockumentary" (14:53) and "Let's Rock 'n Roll: Shock Treatment's Super Score" (6:01), both presented in 16x9 widescreen and produced by a company called Trailer Park, are a good look at the making of the film and its music. The featurettes include recent interviews with Jim Sharman, Sal Piro, John Goldstone, Richard Hartley, Pat Quinn, Sue Blane, Cliff De Young, Betsy Brantley and Mike Molloy. Many Shock Treatment fans know much about the history of the movie already, but there are many interesting anecdotes, comparisons to today's reality TV programming, behind-the-scenes photos, Sue Blane's costume design sketches, and more, to keep it all interesting. An original theatrical trailer (2:37) featuring Cosmo McKinley, and an international trailer (2:20), which does NOT feature Cosmo, are both presented in full frame and their original mono, and are also a great addition to the set. For some reason, though, the international trailer has a very low volume and sounds tinny. Curiously omitted from the disc is the 1981 documentary The Rocky Horror Treatment, which aired on late-night cable, and is a sought-after collectors item. With this DVD, the folks at 20th Century Fox Home Entertainment have done a good job, and this is the best that Shock Treatment has looked or sounded on home video. Some fans might be annoyed by the abrupt edit in the end credits music, but the presentation, vastly improved picture and sound quality, and well-rounded features are well worth the buy. Like RHPS on DVD, this will very likely be shown at conventions, used for screen accuracy, and be a treasure to Shock Treatment fans everywhere. Definitely recommended.